Long aspect ratio screens in smartphones has quickly become the norm, despite being a trend that's barely 12 months old in the mainstream market. The challenge then is to offer up this trendy long screen in a way that's not like anyone else. 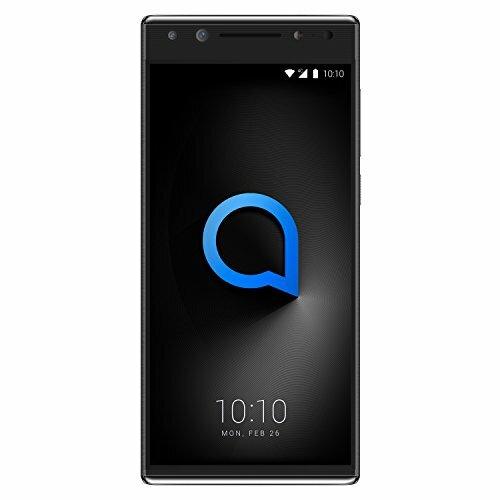 Enter: the Alcatel 5. This phone is looking to stir things up in the affordable phone market, by being something that looks completely different to everything else. It's going to cost just over €200 when it's available, and is striking, to say the least. When it comes to aesthetics, there aren't many phones out there at any price that compare with the Alcatel 5. Immediately from the front, it catches your eye with an unconventional approach to bezel. That's to say, the frame around the screen is almost non-existent on the bottom and up both sides. The only substantial part of the bezel is up at the top, where you'll find the intriguing dual camera system and the earpiece. We'll get into the dual camera system further on, but the finish of this bezel is fairly interesting too. Rather than just be a boring old glossy black panel, Alcatel has seen fit to adorn it with some pinstripes, which also feature on the very minimal framing at the bottom end of the display. The top and bottom edges of the phone are capped off with some very shiny chrome-finish, likely in the hope to make it look a lot more expensive than it is. Which works from a distance, but not so much up close when you can tell it's clearly made from plastic. Other less premium adornments and fixtures include the rounded plastic on the back panel, which feels nice enough in the hand - thanks to some texturing - but does look very plastic-y. As for ports, refreshingly, the Alcatel 5 comes with a Type-C port (not micro USB which often appears on low-end devices), alongside matching grilles that cover the mic and loudspeaker on the bottom edge. One old fashioned port many will be happy to see is the 3.5mm jack, that sits on the top edge. On the right, you'll find the textured power button and slim volume rocker. One big positive of this design however is that it's very easy to hold in one hand. The combination of very slim bezel and a curved back means it's easy to reach almost all corners of the screen without needing to adjust the phone too much. While the way the screen is framed is interesting, the same can't be said of the resolution or quality. It's a 5.7-inch HD+ panel with a resolution of 720 x 1440. It's fully laminated, so there's no air gap between the surface glass and display panel, but in our first look, it didn't seem very bright at all. Colours looked natural enough, but just didn't seem vivid. Still, there are some intriguing camera based features here. The front pairing of a 16-megapixel and 8-megapixel wide angle camera means Alcatel has been able to make group selfies a bit more doable. When the software detects more than two faces in a small space, it automatically switches to the 120-degree wide angle lens to fit everyone in. In our first test, it did work reliably, although took a few seconds to switch. Like the new 3-series, the Alcatel 5 also uses its front facing camera system for facial recognition. It's reliable enough that it won't unlock just using a photograph of your face, and unlocks your phone relatively quickly. We saw it in action, and there was very little in the way of delay between pressing the power button, and the phone unlocking. As for the main camera, that's a fairly straightforward single lens setup with a 16-megapixel sensor with PDAF and a dual tone LED flash. This rear camera is also capable of shooting 1080p video at 30 frames-per-second. One downside of the device is that, at launch, it's going to run Android Nougat. Months after Oreo launched, and despite the fact that most other phones launched in 2018 will have Oreo, Alcatel 5 is running an operating system launched in 2016. Apart from that, all looks well for an affordable device. There's a 3,000mAh battery which - with a relatively low resolution display - should comfortably make it through a full day's use. There's also an octa-core MediaTek processor paired with 3GB RAM and 32GB storage, which should hopefully mean solid performance too. For those worried, you can expand the storage up an extra 128GB using a microSD card. To top it off, there is some form of fast-charging here. It's not as fast as you'd get in a high-end flagship, but the 5V/2A charging should refill the entire battery in roughly two hours from zero to 100 per cent. Apart from the design, there are a lot of typical mid-range features here, like the fast-ish charging, 3GB RAM and 720p display. It's not a list that will make any other manufacturer weak at the knees, but the design should stir some creative minds up to try something new. And with so many other phones out there sharing similar specs and features, it's definitely one thing that will make it stand out.